James M. Baumgartner, alumnus of Western Oregon University, has served on the WOU Board of Trustees since 2014 after serving two years on the WOU Foundation Board (2012 – 2014). 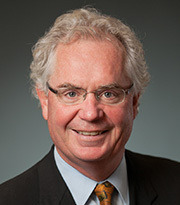 He served on the Executive Committee of the Oregon Consular Corps for five years, serving as dean in 2008, and was appointed as the Honorary Consul of Canada in Oregon in 2005. He is currently General Counsel for Fall Creek Farm and Nursery, Inc. after a long-term relationship of over 30 years with the law firm of Black Helterline LLP in Portland, serving as its managing partner from 2001-05. Baumgartner obtained a bachelor’s degree from WOU and a J.D. from Willamette University College of Law.